This article is about the British radio and television series. For the production company based on the television series, see Little Britain Productions. For other uses, see Little Britain (disambiguation). The programme consists of a series of sketches involving exaggerated parodies of British people from all walks of life in various situations familiar to a British audience. Each of them is introduced with a voice-over narration in a manner which suggests that the programme is a guide – aimed at non-British people – to the ways of life of various classes of British society. Despite the narrator's description of "great British institutions", the comedy arises from the British audience's self-deprecating understanding of either themselves or of people known to them. The programme's title is in part an elaboration of the term Little England(er): a reference to narrow-mindedness and complacent insularity – as exhibited, to humorous effect, by many of the (recurring) subjects of the sketches. The programme was a huge ratings success, receiving 9.5 million viewers following its move to BBC One in 2005. Little Britain initially appeared as a radio show, produced by Edward Flinn, which ran on BBC Radio 4 from 2000 until 2002. Radio 4 began a rerun of all nine episodes in February 2004 (which were slightly edited for content to suit the 6:30 pm timeslot). Unusually, this overlapped with a rerun, beginning in mid-March, of the first five programmes on the digital radio channel BBC 7. In June–July 2004 BBC 7 broadcast the remaining four. Like several other BBC comedies (such as Dead Ringers and The Mighty Boosh), Little Britain made the transition from radio to television. All the episodes for the series were filmed at Pinewood Studios. Much of the TV material was adapted from the radio version, but with more emphasis on recurring characters and catchphrases. The first TV series was one of the new programmes in the launch line-up for digital channel BBC Three, the replacement for BBC Choice, which launched in February 2003. As a result of its success, the first series was repeated on the more widely available BBC Two. Although reactions were mixed, many critics were enthusiastic, and the programme was commissioned for another run. Part of the series was filmed in Kent at Herne Bay - Emily Howard the Lady, and the Lou and Andy sketches. The second series, featuring several new characters, began on BBC Three on 19 October 2004. Its continued popularity meant the repeats moved to BBC One, starting on 3 December 2004. The episodes were edited for their BBC One run, to cut out any material that may be too offensive for the more mainstream BBC One audience. A third series began on 17 November 2005, for the first time on BBC One and not BBC Three, and ended six weeks later. After its transmission, it was unclear whether there would be another, as many sketches were given dramatic twists and "wrapped up" — (see individual character articles). Lucas and Walliams were reportedly in talks for a fourth series with the BBC. Furthermore, they admitted in an interview they preferred to "kill off" certain characters in order to make way for new ones. In 2005, to raise money for Comic Relief, Walliams and Lucas made a special edition of the show, dubbed Little, Little Britain. The episode included a variety of sketches with celebrities including George Michael, Robbie Williams and Sir Elton John. This was released on a limited edition DVD and was released in the United States as Little, Little Britain on the region 1 version of the Little Britain: Season 2 DVD. In 2006, a two-part Christmas special was released, in which characters from the programme were depicted as visiting other countries. As a success of the television series, Lucas and Walliams created a travelling stage show based upon their series. A special live version, featuring appearances from celebrities such as Russell Brand and Dennis Waterman was filmed in 2006 and appeared on 2007's Comic Relief show. 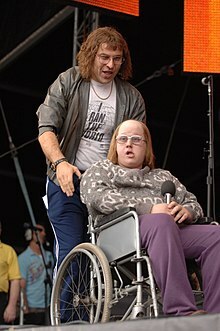 In 2007, Matt Lucas and David Walliams announced that there would be no more of the British Little Britain, but they taped an American continuation of the programme entitled Little Britain USA, which featured both returning characters from the British series as well as new American characters. According to David Walliams, the new show is "effectively Little Britain season four". The show debuted on HBO at 10:30 pm EST Sunday 28 September 2008, then the following week on BBC One in Britain. It also started airing on The Comedy Network in Canada in January 2010. Crossover between the UK and USA versions. Last episode to feature Matt Lucas. David Walliams reprises the role of Lou Todd for Comic Relief. Guest stars include Stephen Hawking and Catherine Tate. Matt Lucas does not feature. As a sketch show, Little Britain features many characters with varying degrees of costume and makeup. Matt Lucas and David Walliams play all the main characters in the show. Tom Baker narrates and Paul Putner, Steve Furst, Sally Rogers, David Foxxe, Samantha Power, Yuki Kushida, and Stirling Gallacher regularly appear as several different characters. Other regular cast include: Anthony Head as the Prime Minister, Ruth Jones as Myfanwy, Charu Bala Chokshi as Meera, and Joann Condon as Fat Pat. A two-part Christmas special, Little Britain Abroad, was broadcast in December 2006 and January 2007. This makes a total of 25 episodes to date. There has also been the Little Britain Live show. In the UK, the series was originally broadcast on BBC Three and BBC One and was aired in repeats on Dave, Gold, and Watch. In the US and in Bermuda, the series airs on BBC America. BBC Canada aired the program from 3 March 2005 – present. UKTV broadcasts the program in Australia and New Zealand. Comedy Central India broadcast the program for Indian audiences. Journalist Owen Jones argues in his book Chavs: The Demonization of the Working Class that Little Britain helped to perpetuate unkind stereotypes about working class people: exacerbated by the fact that both Walliams and Lucas attended private schools. The series has become increasingly popular with children, despite being shown after the watershed. There has also been criticism from teachers that the programme leads to inappropriate copycat behaviour in the playground. Speaking in October 2017, Lucas explained that if he were to re-make Little Britain he would avoid making jokes about transvestites and would not play the role of a black character. Lucas went on to say that "Basically, I wouldn’t make that show now. It would upset people. We made a more cruel kind of comedy than I'd do now ... Society has moved on a lot since then and my own views have evolved". Lucas, however, defended the decisions that were taken at the time, and explained that he and co-star Walliams deliberately sought to play a very diverse group of people. "I'm Gay", the song that Matt Lucas's character Daffyd Thomas sang at the end of the Little Britain Live shows, was released as a CD single in Australia in March 2007. Matt Lucas and Peter Kay, in the guise of their characters Andy Pipkin and Brian Potter, re-recorded the song "I'm Gonna Be (500 Miles)" with its creators, The Proclaimers. This version was released as a charity single for Comic Relief on 19 March 2007. Little Britain: The Video Game was released in February 2007. It featured a variety of characters in mini-games and received very negative reviews. The Russian series Nasha Russia is inspired by Little Britain. In 2010, characters returned for Nationwide Building Society adverts, including Lou and Andy, Vicky Pollard, Eddie (Emily) Howard . ^ "'Victorian London - Districts - Little Britain'". Victorianlondon.org. Retrieved 16 August 2012. ^ "Ratings record for Little Britain". The Guardian. 18 November 2005. ^ Kent Film Office. "Kent Film Office Little Britain Article". ^ "Little Britain USA". littlebritainfans.com. 2008-09-28. Archived from the original on 2012-07-31. Retrieved 16 August 2012. ^ "BBC One - Little Britain". Bbc.co.uk. 28 July 2012. Retrieved 16 August 2012. ^ "Little Britain". Uktv.co.uk. Retrieved 16 August 2012. ^ "Little Britain comes to BBC Canada". Channel Canada. 16 February 2012. Retrieved 16 August 2012. ^ "Schedule". BBC Canada. Retrieved 16 August 2012. ^ Series 1. "Little Britain - UKTV Australia". Uktv.com.au. Archived from the original on 2007-07-02. Retrieved 16 August 2012. ^ Jones, Owen (2011). Chavs: The Demonization of the Working Class. London: Verso. p. 127. ISBN 978-1-84467-864-8. ^ "I would not play black person in remade Little Britain, says Matt Lucas". The Guardian. 3 October 2017. Retrieved 3 October 2017. ^ Lyon, James (16 February 2007). "Little Britain: The Video Game". ^ Walker, Shaun (28 July 2008). "Russia buys the right to have a laugh at Moscow's David Brentski". The Independent. London. Retrieved 11 May 2010. ^ "Moscow News - Columnists - 'Nasha Russia' must go on". Mnweekly.ru. 12 February 2009. Archived from the original on 2009-02-12. Retrieved 16 August 2012. ^ Sweney, Mark (14 May 2010). "Little Britain's David Walliams and Matt Lucas star in Nationwide ads" – via The Guardian. Julia Snell (2006). "Schema theory and the humour of Little Britain". English Today. Cambridge University Press. 22: 59–64. doi:10.1017/S0266078406001118. Carol Szabolcs (2008). Little Britain in America. Minorities under subverted scrutiny. Grin Verlag. ISBN 978-3-640-30153-9.